Includes business name, address, phone numbers, website address and direct link service to website. Includes business name, address, phone numbers, website address and direct link service to website. 20.00 per month or 220.00 per year. *Click below for yearly package. Includes business name, address, phone numbers, website address and direct link services to website, and *** 2 lines or 25 word to describe business. Includes business name, address, phone numbers, website address and direct link services to website, and *** 2 lines or 25 word to describe business. 25.00 per month or 275.00 per year. *Click below for yearly package. Includes business name, address, phone number, website address and direct link service to website and *** 5 lines or up to 60 words to describe business and 2X1 inch photo of the customers choice. 35.00 per month or 385.00 per year. *Click below for yearly package. Includes business name, address, phone numbers, website address and direct link service to website and*** 8 lines or up to 100 words to describe business, 2½ by 1½ photo of customers choice, and 2 week free banner space on internal category page. Includes business name, address, phone numbers, website address and direct link service to website and*** 8 lines or up to 100 words to describe business, 2X1 photo of customers choice, 1 week homepage banner space, 1 feature story. Also includes social media advertising for annual subscribers. One post to facebook and instagram per year with additional post at discounted rates. (over 97,000 authentic followers). 40.00 per month or 440.00 per year. *Click below for yearly package. Includes business name, address, phone number, website address and direct link service to website and *** 5 lines or up to 60 words to describe business and 2X1 inch photo of the customers choice. *Listing will be based on package purchased. Platinum pages will be listed first alphabetically(A to Z or Z to A), gold packages second alphabetically (A to Z or Z to A) and so on. *Custom packages available, please contact us direct. Social Media gives your business unique ways to reach potential customers. Specific markets can be targeted and updated with special promotions, news, events and more. Instagram, Facebook, Twitter, and Pinterest are all great platforms to distribute your message. Islamorada Times can create a social media presence and manage and maintain accounts as needed. Please call or email us to discuss all the possibilities. 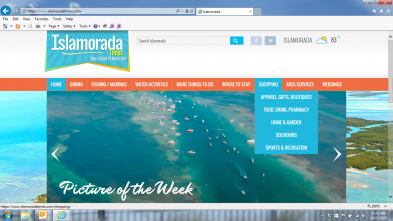 Islamorada Times and its partners specialize in website design. We can either take your existing page an update it or create a brand new design. Content placement, ongoing support, hosting and maintenance are all included. We provide a quality service at competitive prices.